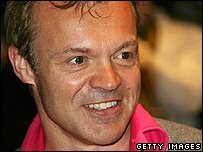 In an interview for Marie Claire magazine, BBC television presenter Graham Norton tells it like it is: "I took ecstasy... It was absolutely amazing. It was just fantastic - really, really fun." And now he's taking the good news to the world - with a little help from his friends in the global media. Around the world, there are 39 stories on this topic (according to Google News), and Stuff.co.nz is among those running the story. There are those who think the truth should not be told. A spokesman for the National Drug Prevention Alliance said, "He's in the public eye and influencing young people, so who is it helping? I don't know - I'm just staggered." You see, sometimes telling the truth sends the wrong message to young people. A sound fact is not always a solid idea. "We're appalled, it's absolutely mind-blowing that somebody has said that," said the National Drug Prevention Alliance spokesman. Yes, that's right. Absolutely mind-blowing. A lot like ecstasy, then. You see, talking about drugs can be really, really fun, too. And blogging about them is just fantastic! Peter Jeeniings, the Canadian by birth but world famous in USA anchorman put together a superb television '60 minutes' style show on MDMA. The naysaying therapists/law/moralists came over like grinches, whereas objectivists/consumers and a great number of pharmacologists types said, hey whats the problem!. The well adjusted folk were smiling and were by far, better representative of humanity than the selfprofesing 'we can save the world from all scourges' types who were a sad lot indeed. The deluded make good company of themselves. The road to hell is paved with good intentions. Its worth a watch, even entertaining. (search Utube 'jennings, mdma' ) Its 40 or so minutes. Share it with friends. It makes our 'Expert Committee on DRUGS" upgrade of 'E' look palpably inane and those who compare it by way of the pol-speak "amphetamine type substances' a danger and menace to society.